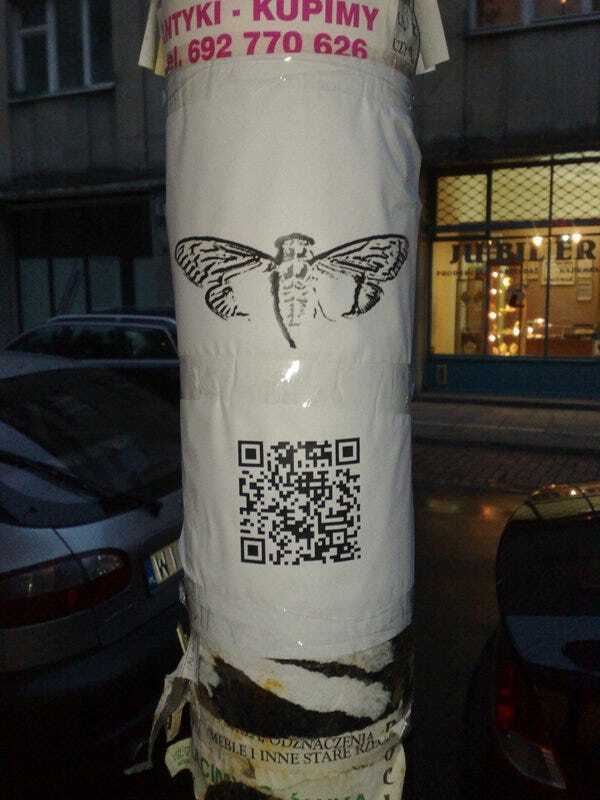 The anonymous group behind a bizarre online puzzle, known only as "Cicada 3301," or 3301 for short, has ended more than a year of silence with a single tweet. The January 5th tweet sent amateur sleuths back to the drawing board to re-examine previously abandoned leads in the hopes of solving the mysterious puzzle and claiming an unknown reward. The tweet contained a link to an image in the signature style of 3301: white text on a black background. Hidden inside the image file was a known cryptographic signature proving that the message could only have been sent by the group itself rather than the imitators who crop up every year. 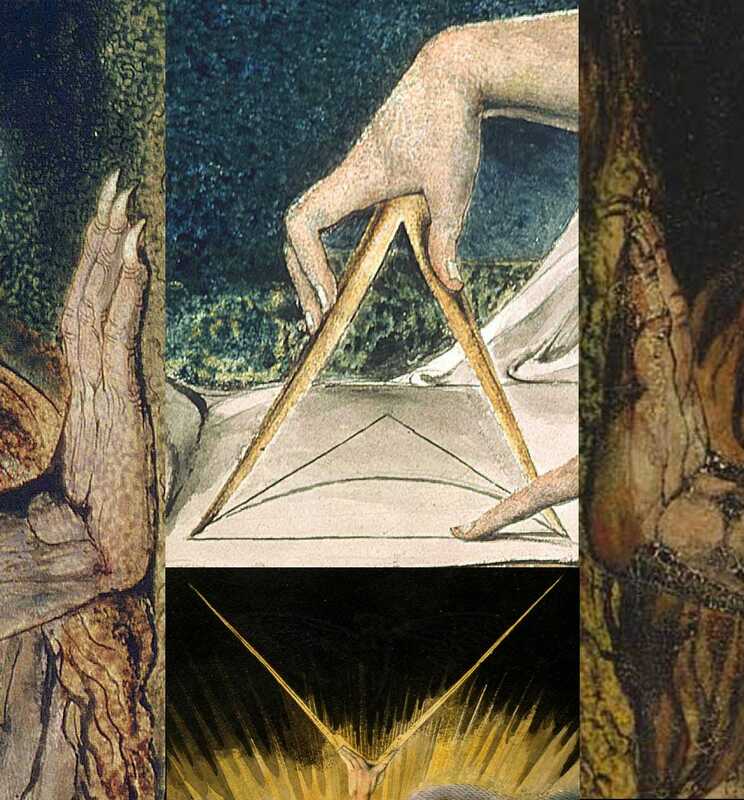 The image's message, however, seems only to suggest that solvers go back to something they'd practically given up on: "Liber Primus is the way. Its words are the map, their meaning is the road, and their numbers are the direction." 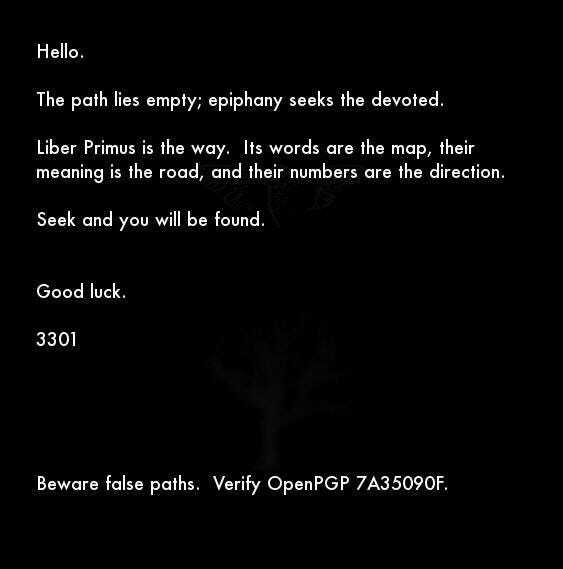 Liber Primus is the name given to a nearly-60-page book of runes discovered at the end of the 2014 version of the 3301 puzzle, and it remains largely undeciphered to this day, having been practically abandoned out of frustration. 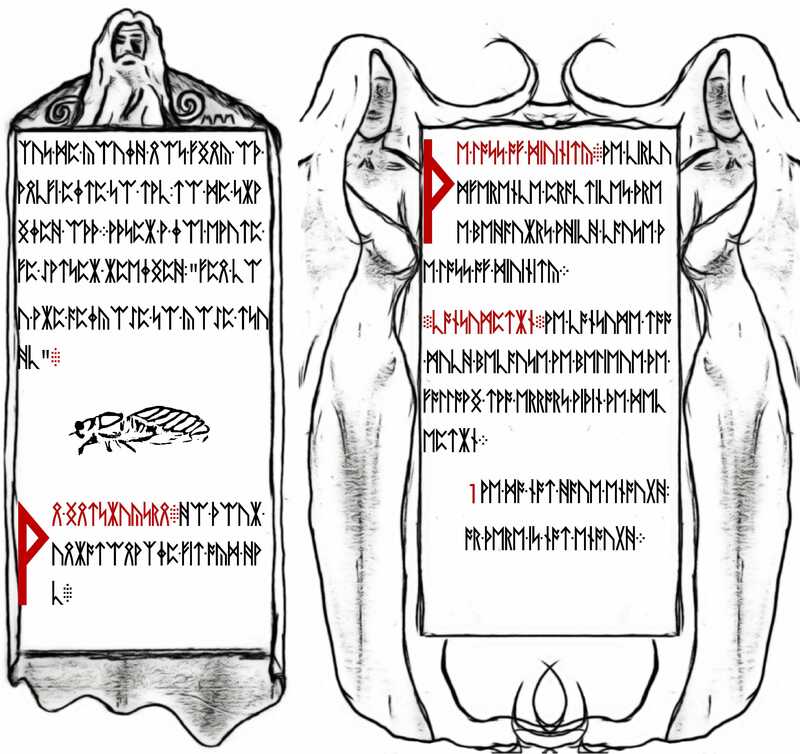 "Runes... don't get me started on those," a 3301 solver who goes by the handle soulseekah told Business Insider. "[The] runes puzzles sucked, too many ways to interpret them, too many possibilities to hide data in them. It quickly went from a rigorous [capture the flag]-type of contest to a Dan Brown world of magic, hidden messages and pseudo-b*******." Jordan Thompson, a computer science student who made it through both the 2013 and 2014 puzzles, up to the runes, had a similar response: "[The Liber Primus] felt like a slap in the face to those who thought they'd made it through [the 2014 puzzle]." Marcus Wanner, one of the solvers of the original 2012 puzzle, was put off too. "I was initially attracted to 3301 because they built the puzzle the same way as I or most other free software developers would have," Wanner told Business Insider, "and this kinda flew in the face of that." Wanner's gave an interview of his experience with 3301 to Rolling Stone for a story early last year, and the spotty history of the puzzle he provides helps explain how the group's return might bring more trepidation than excitement from the enthusiasts who spent hours trying to crack its mysteries. Here's what happened. In early 2012, a mysterious image started amateur sleuths off on what became a massive online cryptographic puzzle. The winners, as we would later learn from Wanner's account and a leaked email, were recruited into a group with goals of "researching and developing techniques to aid the ideas we advocate: liberty, privacy, security." According to Wanner, the 2012 solving group had been collaborating on a project called CAKES through a website set up by 3301. CAKES was designed to protect whistleblowers from retribution, but it fell apart when members began to tire of the work. Then in 2013, a new version of the puzzle started up again. The newest batch of solvers were told they would be put in contact with last year's winners, but the mysterious group behind 3301 never followed up on that promise and the site it created for the 2012 solvers to communicate was then shut down suddenly. 2014 brought yet another puzzle, this time with a forking conclusion. Puzzlers were told to create a server that 3301 could send a file to. Some received an unpersonalized recruitment letter similar to those from previous years — but never any follow-up. Others received a link to a deep web site that would eventually contain the now-infamous Liber Primus runes. When January 2015 rolled around, the same time of year all the other puzzles began, nothing but fakes ever turned up. 3301 had disappeared, breaking its silence only once to distance itself from a group using the same name. "As far as I was concerned, 2014 was solved," Thompson told Business Insider. He felt that the runes were likely some sort of consolation prize or bonus puzzle for those who hadn't made it through 2014, even though no one ever received anything for "solving" that year's puzzle (or the one before it). Thompson felt like the 3301 group had seen the slow dissolution of the 2012 solving group as a sign that their recruitment strategy hadn't worked, hence never following up with the 2013 solvers. The 2014 puzzle, he theorized, was just a way not to disappoint after all the built-up hype. But the new tweet, which followed on the tail of the latest imitators, instead pointed solvers back to those runes? "I guess this means instead [the runes were] intended to be the next year's puzzle." Despite having already thrown every trick in the book at the runes, the old solvers can't help but be enticed again. Thompson said that, while he was feeling cautious about diving back in, "it's impossible after all this time and effort not to be interested to hear such a directed suggestion from [the 3301 group]. ... I'm just trying to keep a sane level of involvement for now." In a later email, Thompson conceded, "I've already spent about 6 hours on it today, so I'm guessing I'm pretty hooked for now." How could he not? "I saw all those familiar names [coming back into the chatroom] when the message happened." "I've looked into some non-Cicada puzzles and [alternate reality games], but nothing seems to have the difficulty and challenge present in the 3301 puzzles," said David Gotrik, a systems engineer who participates in the 3301 community under the handle of onecool. Gotrik isn't phased by 3301's low profile and long time off. "They've always been mysterious." Wanner isn't discouraged by 3301's sporadic activity either. "Their work speaks for itself," he told us. "It turned into frustration and paranoia for some people, but I looked at is as just a game." Soulseekah's attitude on returning to the runes characterizes the frustration that Wanner mentions: "New clue' my a**, not even going to bother." But even he admitted that he would be getting involved with the community and solving effort again. "Absolutely, the technical challenges are still inspiring." In the week since 3301's return, progress has been slow. Wanner didn't feel that much progress had been made, but Thompson seems optimistic. "There's a lot more work being done," Thompson said, "and a lot of analysis that should have been done years ago that's now got enough people interested again that it can happen." Solvers are trying to find common phrases that 3301 has used before in the encrypted runes, with some success that may or may not be coincidental. "We have to fail it a lot before we get it right," Thompson said. "So I can't say [the runes are] solved yet, but this time I do only think it's a matter of time."